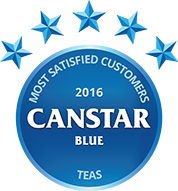 Sit back and relax with a quality cup of tea using Canstar Blue’s customer satisfaction ratings. The results are in, and we can announce that Dilmah was the only one to score five-star ratings from consumers for both taste and overall satisfaction. Tea is widely considered to be the world’s most popular drink (aside from water, of course). In fact, you will be hard-pressed to find a New Zealander who doesn’t enjoy, or at least appreciate, a nice cup of tea. According to our survey (of tea-drinkers, granted), it’s the hot beverage of choice for more than one in three Kiwis (36%), while 26% of respondents drink more than three cups a day. Not everyone enjoys tea the same way. Of the adults we surveyed, 59% say they take their tea with milk, while a quarter claim to have completely cut sugar from tea for health reasons. However you drink it, tea is a great beverage for any occasion – especially when it comes to entertaining guests, so it’s perhaps not surprising that 70% of New Zealanders say they will always have tea stocked in their cupboards. According to our research, 41% of shoppers say they will always buy the same brand of tea. While it’s completely natural to have a preference, are you sure you’re getting the best tea for your money? To help answer this question, Canstar Blue has surveyed tea-lovers across the country to find out which brand of tea really is the most-loved of them all. The results are in, and we can announce that Dilmah was the only one to score five-star ratings from consumers for both taste and overall satisfaction. Canstar Blue commissioned I-view to survey 2,500 New Zealand consumers across a range of categories to measure and track customer satisfaction. The outcomes reported are the results from customers within the survey group who have purchased and drunk tea in the last three months – in this case, 1,822 New Zealanders.